Abra wallet is now fully supporting ETH, which means the users will now be able to transfer Ether through third party addresses using the mobile app, and store Ether on their accounts. Abra also launched a promo that will be effective till the end of March: anyone who buys ETH for at least $5 will get $25 more in ETH. The issue on Ether status as a security is still being developed. The US SEC believes this status has been changed: before, the crypto had some similarities with a security, but now it’s not so. In Switzerland, meanwhile, SIX Group exchange launched Ethereum-ETP, which means the local commission doesn’t question Ether’s status. The new product ticker is AETH; this is the third time such a product is being launched over the last five months. The market is barely interested in the new Ether algorithm, ProgPoW, and the respective update called Intanbul. Ethereum has just launched its hard fork, but the devs think it’s not enough to resolve all Ether’s issues. Technically, Ether is forming a bearish downtrend on W1, with the target at the long term support, $10. Currently, the crypto is correcting locally after the MACD convergence and the Stochastic forming a golden cross. After this correction is over, the local support may get broken out, and the price may get pushed to the major target, especially if the Stochastic forms a black cross and the MACD gets negative. On D1, an ascending correctional channel is being formed. The latest upmove reached the fractal resistance, which was a support before. The MACD is rising, which may make one assume the price is going to rise to $190. Conversely, if the current support at $115.25 gets broken out, a midterm downmove may start. 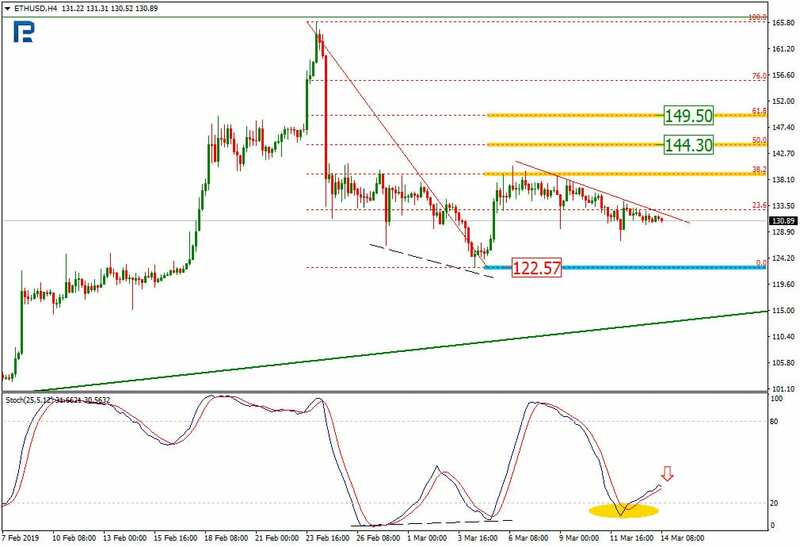 On H4, the Stochastic converged, and the correction reached 38.20% Fibo. Currently, the price may break out the local support and move to 50% ($144.30) and 61.80% ($149.50). If the Stochastic forms a black cross, however, the price may go down to the local low at $122.57, and then to the correction channel support.